​​​​ ​Founded in 2000, Beijing Resource Import & Export Company Limited is one of the leaders in its industry in Beijing, China. 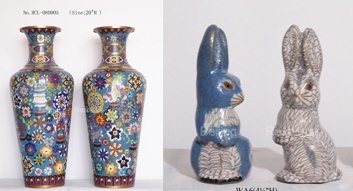 The core of our business function is in the manufacture and export of ​​traditional Chinese handicraft products – such as Cloisonne ware, Porcelain, Chinese traditional style furniture, Glassware and many more. Operating across the Chinese Arts & Craft industry over the years, Beijing Resource have established our own brand ‘ZI JIN CHENG’ (FORBIDDEN CITY) – a home décor, quality lifestyle product division that produces creative and inspiration design of homewares, gifts, novelties souvenirs and festive items, following the latest design trends​​​​.